I guess the excitement of the end of season show was all too much to take for the players today as we literally fizzled out with a whimper. Rumours of a retained list showing as many as eight players leaving the club and recruits like Matty Dolan, even Gary Liddle coming back were rife on the terrace. As you know I don’t do rumours just facts so you heard it here first, Ned is going on a free and Jim Provett is making his comeback. I have to write rubbish like that just to get something on record. Especially as the only thing we won today was the toss. At least we had advantage of kicking down hill again the second half. If the rumor of eight players on their way were true then that would excuse the poor collective performance today. 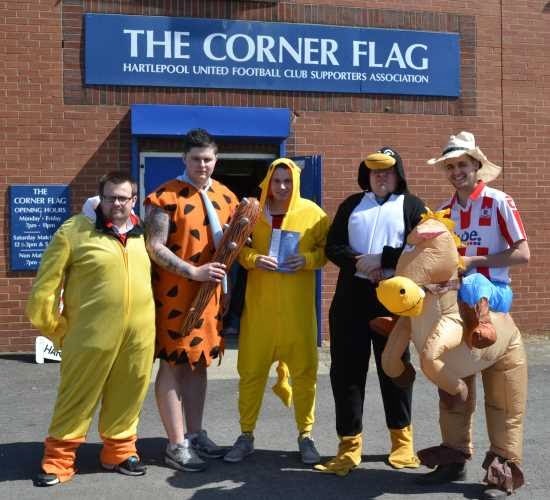 Before the game I spoke to a group of visiting fans who were very impressed with Pools visit down to their ground and claimed the Pools who beat them three nil had been the best team to visit all season. I did ask them not to expect too much today as we were a few players unavailable and our form of late was average to poor. Thankfully today’s report was not on an end of season “squeaky bum” situation. How sad is that, me using Ferguson phrases, which I hate. The truth of it was today we were taught a good lesson for life. Never underestimate thine enemy. From the off Exeter were pulling us all over the pitch and making some good chances for their forwards. They were quick and came in numbers, pressing us back throughout the game, We did not have the players to make any headway against a team that were hoping for revenge for the early season defeat. They scored two cracking goals that brought good applause from the Town End for the way they exposed our poor defensive display and the way the goals were scored. A great ball lifted over Flinders was the result of the probing by a lively attack. I was surprised it took them twenty minutes to score, as the pressure we were under was continuous. "Just maybe the rumour that some of the players had been told they were surplus to requirements could explain the lack of fire in the troops today." Their second goal was even better than the first as a long ball over the top was expertly brought under control and the lad had all the time in the world to side step the advancing Flinders and calmly stroke the ball home for a two nil lead. We always say we never get the rub of the green yet when we do we invariably mess it up. Today we did just that as we were awarded a penalty late in the half and Compton hit the keeper with his blast at goal. It crossed my mind at half time when I saw a couple of old guys celebrating a birthday by being allowed on to take penalties against H'Angus. I watched in amazement at how easy it was to stroke a penalty home from twelve yards. Ok it was against a monkey but the monkey was the only one that missed. Half time was when I realized the Cooper was actually at the game, forty five minutes spent sitting in the dug out could add to the rumour that he was getting grief from the CK fans so decided to keep his seat warm. He did pop out twice late in the second half as the subs came on, but this was not the man we see standing in the technical area throughout the game. Two absentees from the bench or the players group who saluted the fans at the end of the game were Monky and Walton. It was nice to see Burgess out there with the lads. OK I have skipped over the second half basically as there was little to report that was not said in the first half report. Marlon needs to show the energy he showed in a very brief spell in the second half much earlier in the game, not when the game is lost. A young lad no one could name at the time came on for the last ten minutes and was unlucky not to connect with his first touch but once again the visitors were too good for us. One plus was to see Luke James in the list as sub so hopefully no damage from his tangle with the sprinkler at Burton. Harrison was named man of the match, which says it all, that your centre-back wins the accolade. Just maybe the rumour that some of the players had been told they were surplus to requirements could explain the lack of fire in the troops today. Having said that you have to congratulate Exeter coming all that way and turning on a performance like they did, giving Pools a football lesson, well done Exeter. And here's a group of their fans who did almost all of the trip done in reverse the previous week by International Rescue, but went home happier with the result.